Modern barstool seating has never been better than with the Merano natural oak barstool from Alex Gufler and European furniture leader, TON. Begin with outstanding, on-trend Italian design and then add European construction for good measure giving designer furniture lovers an attractive, well made modern kitchen barstool for your upscale kitchen or modern breakfast bar. With a frame of Natural oak and a Dura-Mod seat pad in black, this modern designer barstool offers just the right amount of contrast and comfort. 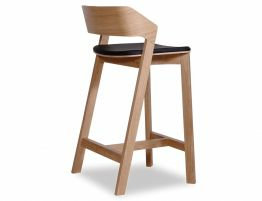 Make the Merano natural oak modern barstool the anchor in your modern kitchen, there are also dining chairs in this same style if you are looking to bring together both chairs and barstools in your space. When planning the design of your kitchen keep in mind that it is one of the most often used spaces in your home. Don’t settle for cheap, throwaway furniture pieces when you can invest in modestly priced, exceptionally crafted designer furniture that will last a lifetime.